For as long as we can remember, we've been told that our makeup should directly correspond to what we're wearing, be it in complementary colors or to matching effect. Well, leave it to Lush to turn that whole concept on its head. The beauty brand recently unveiled its first foray into color cosmetics with Emotional Brilliance — makeup that's meant to be chosen not by color but by your mood. Bear with us here—there's more to this than you might think. Basically, you spin the color wheel at any Lush store and when it stops, you choose the three colors that most jump out at you. You don't choose them because they're your favorite, or because they'd match your new dress, but because at that very moment you are instinctively drawn to them. The order you choose your colors in matters, too (of course), so go with your gut. According to the brand "if one believes enough in something, there will likely be a change in behavior." All from a lipstick, eh? We still aren't sure how we feel about all the hoopla surrounding these products but we have to admit, we love us some Lush and we really love us some makeup. And with 30+ vegan options to choose from, including mascara, skin tints, and translucent powder, we have to say we were quite taken with this quirky yet charming line. Plus, those adorable eye dropper bottles definitely helped sway us as did the vibrant array of feel-good hues. We've always believed that beauty should make you feel good, and this just takes that maxim a little bit more literally than you might have expected. But what do you think? Would you choose your makeup by your mood, or are you a strict "match it to your wardrobe" kind of gal? 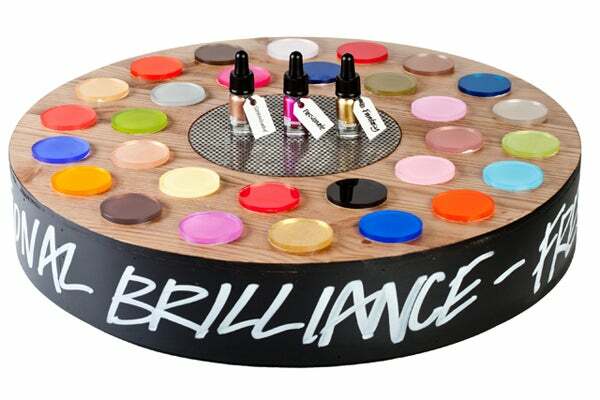 LUSH Emotional Brilliance, $18.95-$22.95, available at LUSH.